I can’t say that I would wholeheartedly recommend Elaine Sciolino‘s recently published La Séduction: How the French Play the Game of Life. It’s not that it isn’t interesting, or that the anecdotes that she includes don’t entertain — they do. Maybe it’s the tone. Or the fact that I can’t figure out whether it is meant to be some kind of non-scientific monograph on seduction, or some kind of memoir. I will say that if you are in frequent contact with a bunch of French people, it can be illuminating. Had her book been around earlier, it might have given me some insight as to how to have made my graduate-student life easier by not taking things so seriously. It ain’t fun if it ain’t charming. And if it ain’t charming, it’s probably American. Maybe that’s why I don’t like the book: the author is clearly very cultured, intelligent, well-read, and well-traveled, but still manages to come off as a frustrating rube. She’s been living in France since 2002. In the end, Sciolino cannot help but be charmed over and over again by the French. But each of these “you-won-me-over” moments follows the exact same cycle: Journalist doesn’t understand why the French do X. Journalist seeks the help of the French intellectual crème de la crème to help explain it to her. She still doesn’t understand, and protests using the the biggest American clichés and cultural stereotypes at her disposal. She tries it out reluctantly. It works. She is now a converted. There was one chapter that I very much enjoyed: the story about when Guy Savoy (Guy Savoy!) invited her to take a quick trip with him to his mother’s house to have lunch with his family. It might almost be worth the book — or at least reading it in the bookstore, and then putting it back on the shelf. Even when Savoy is chez maman, he can’t help being in control: Where is the cream! Where is the knife! No, the one that cuts! Smell this! Try this! Where are the glasses! Champagne! And the meal is fabulous. Full of stick-it-to-your ribs country goodness: salad, andouille, butter, potatoes, côte de boeuf, petits pois, morels, vanilla and raspberry ice cream, more cream, white sugar, meringue, hazelnut biscuits, coffee, obligatory nap. On their way back to Paris, Savoy admits that he had never brought an outsider to his mother before. Why, Sciolino asks, did he take her? So of course after reading that, I had to have my own simple little country affair: just some excellent CSA andouille done in the oven, served with boiled local fingerling potatoes cut into coins. Melted butter and parsley. Does that need a recipe? 1. Set your oven to 350°. 2. In a large pot of salted water, boil the potatoes until you can easily pierce them with a paring knife. Drain them and set them aside to cool enough so you can handle them without burning your fingers. 3. Rub the andouille with olive oil, and pop it in the oven. It should cook for about 10-15 minutes. The andouille that I get from my CSA is pretty lean, so it might cook more quickly than yours. Check it after about 10 minutes for doneness, and leave it in the oven for longer if it needs more time. 4. In a small saucepan over low heat, melt about 4 tablespoons of butter with 1 teaspoon of salt and freshly ground black pepper. When the butter is melted, turn off the heat and add about a tablespoon of finely chopped parsley. 5. 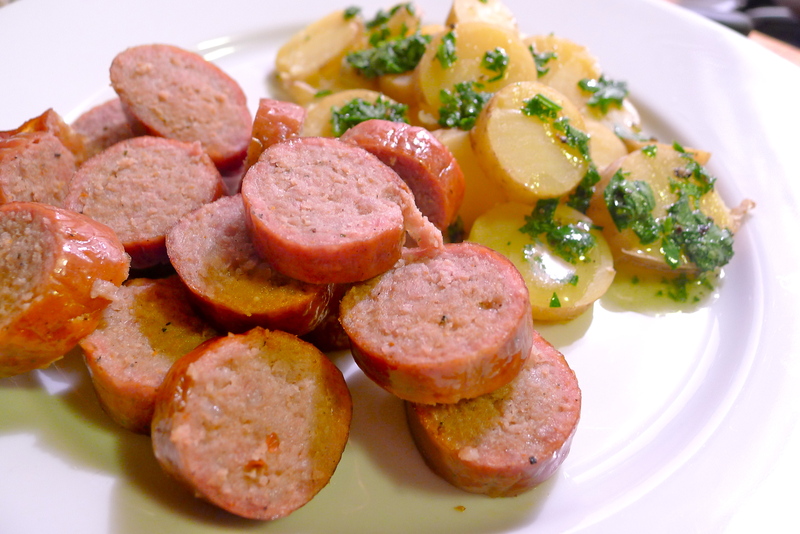 When the sausage is done, slice it into coins, along with the fingerling potatoes. Spoon the melted butter and parsley on top of the potatoes, and serve immediately. That andouille really was delicious, wasn’t it? I haven’t read the book, but your observations seem to match what I’ve found to be the general trend in Americans writing about the French. Particularly the french “way of life”. It’s frustrating – I feel like there are a lot of deeply held misconceptions in both cultures – and everything getting published on our side seems determined to further those misconceptions. But man, can you imagine having lunch at Guy Savoy’s mother’s? That would be a definite once-in-a-lifetime moment. My ex has this friend who doesn’t eat seafood, and likes his steak well-done. He got into El Bulli for dinner. What is with good meals wasted on the wrong people! That does sound like fun! I heard about the Toklas book a long time ago, but I’ve never had a chance to read it. If I can get it together to come on Monday I will but if not, I’ll definitely come next time it’s on. Argh! Wasn’t able to make it last night. Passed out early! But am looking forward to making it to the next one! Wow! That sounds like fun! Thanks for letting me know about this!